← Who reviews scientific papers and how do reviews work? Creationists often like to claim that there are two fundamentally different types of evolution: microevolution and macroevolution. They argue that microevolution does actually occur, but only produces small changes within a species or “kind” of animal. For example, most creationists are generally okay with the concept that all finches evolved from a common ancestor, all crows evolved from a common ancestor, all ducks evolved from a common ancestor, etc. However, they draw the line roughly at the taxonomic level of family (e.g., ducks are in the Anatidae family), and they argue that evolution beyond that level (what they call macroevolution) is impossible and has never and can never happen. Thus, they dismiss the notion that finches, crows, and ducks all share a common ancestor. I have written about this before and explained that this distinction is completely arbitrary and meaningless because the exact same evolutionary mechanisms that caused the evolution of finch species could (and indeed did) cause the evolution of all birds. In other words, macroevolution is simply the accumulation of microevolutionary steps, and one inherently leads to the other. Since I have written a detailed explanation of the problems with creationists’ reasoning, I decided to take a different approach for this post and provide a visual explanation. The image below shows a hypothetical pathway through which turtles could have evolved from their lizard-like ancestors (several of these images are renderings of actual fossils: B6 = Milleretta, A15 = Eunotosaurus, C22 = Odontochelys, B30 = Proganochelys, D37 = Chelydra [modern turtles]; these are just screen shots from Dr. Tyler Lyson’s excellent video). This full progression is, of course, what creationists would consider to be macroevolution, and creationists are adamant that today’s turtle families were uniquely created and did not evolve from a lizard-like ancestor. However, because they accept microevolution, most creationists would have no problem with any particular pair of images, and they would accept that A1 could evolve into B1, B1 could evolve into C1, etc. In other words, each pair of images shows “microevolution” (which creationists almost universally accept), but when we string all of those steps together, we get “macroevolution” (which creationists say is impossible). You can probably see where I am going with this, but just to be sure, I will state it explicitly. If you are going to say that macroevolution is impossible and turtles could not have evolved from lizard-like ancestors, then which step do you think is impossible? Please show me which step could not have occurred, and justify that claim. Additionally, please explain the obvious transitional fossils. Remember, B6, A15, C22, B30, and D37 are actual fossils, and they perfectly match the expectations for what a transitional fossil should look like (details here). So, if turtles and their lizard like ancestors were uniquely created kinds, then at what point in this progression do lizard-like reptiles end and turtles begin? Evolution is like the visible light spectrum (A) with each color (species) gradually changing into the next without a clear point at which one ends and the other begins. Creationists predict something like B, where each “kind” is unique and distinct form the other kinds. What we actually find in the fossil record is C. There are clearly transitionals that creationists say shouldn’t exist, but because the fossil record is incompletely, we will never have every single step in the spectrum. At this point, some people will likely be inclined to ignore my questions and harp instead on the fact that this pathway is hypothetical, but that argument completely misses the point in several ways. First, this pathway is only partially hypothetical because B6, A15, C22, B30, and D37 are actual fossils that we have found. Additionally, of course the pathway is partially hypothetical. We will never find every single one of these steps, and we don’t need to in order to defeat creationism. 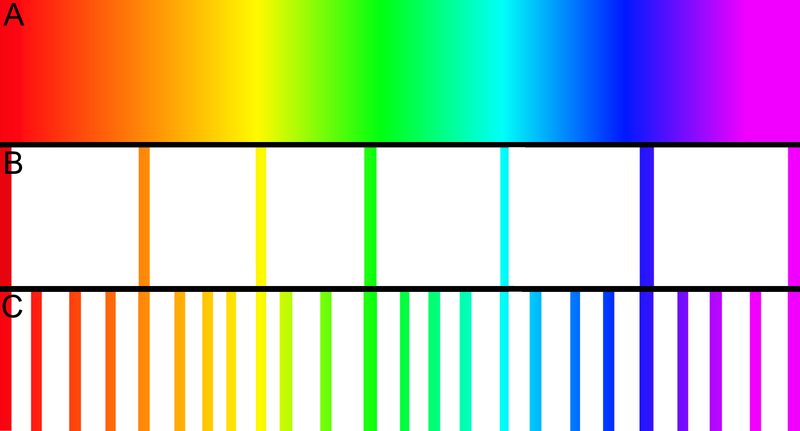 Evolution is very much like the visible light spectrum. Each color gradually fades into the next color without a clear breaking point. In other words, there is a point along the spectrum that is clearly red, and there is a point that is clearly blue, and there is a point that is clearly violet, but there is a spectrum of change in between those points and it is not possible to pick an exact point where the blue ends and violet begins, just as you cannot pinpoint the exact step at which the reptile becomes a turtle as we know it. The problem is that the fossil record is extremely incomplete. The conditions that are required for a fossil to from very rarely occur, and the vast majority of dead animals are eaten rather than fossilized. So only a remarkably small subset of animals ever become fossilized. Additionally, even if a fossil is formed, it has to survive for millions of years without being eroded away, and we ultimately have to find. As a result, the fossil record will always be incomplete and it is totally unreasonable to expect that we would find every single one of the steps illustrated above. However, what we have been able to find is plenty to refute creationism, because creationism claims that animals were created as distinct kinds. In other words, it does not predict a spectrum. Rather, it predicts that there should be blues and there should be violets, but there should not be intermediate steps. What we actually find in the fossil record is, of course, an incomplete spectrum with lots of intermediates, which is exactly what we expect from evolution. Look at A15 (Eunotosaurus), for example. It’s certainly not a modern turtle, but it’s not a lizard either. It has half the traits of both groups. It is precisely the type of intermediate that creationism says shouldn’t exist. Finally, the argument that this pathway is meaningless because it is partially hypothetical misses the point because it is absolutely fine to use hypotheticals to defeat absolute claims. Creationists claim that macroevolution cannot happen, and this pathway shows that it can happen. In other words, to defeat the claim that macroevolution is impossible, I don’t need to prove that this pathway actually occurred; rather, I simply have to show that a pathway is possible, which it clearly is. We can of course do this for tons of examples of macroevolution. For example, scientists have known the steps involved in the evolution of an eye for a very long time, and a close examination of the structure of bacterial flagella has shown that it is entirely possible for flagella to have evolved by evolution. In short, if you are going to insist that macroevolution is impossible, then I want you to look at the evolution of the turtle and tell me which step is impossible (and justify that claim). I also want you to explain the existence of the known intermediate fossils (without committing an ad hoc fallacy), and I want tell me the exact point at which modern turtles first appear. If you are going to comment in defense of creationism, then I expect an actual answer to those questions. Note: Please read this post before bringing up the fundamentally flawed “irreducible complexity argument” (spoiler alert: it ignores the fact that evolution is blind and each step simply needs to be useful for something, rather than being useful for a particular end product). Note: Before anyone responds by saying that “Darwin himself said that the notion that an eye could evolve was ‘absurd,’” please realize that this argument misquotes Darwin. What he actually said was that saying that an eye could form naturally seems absurd…until you understand evolution. He went on to explain how the eye could have evolved via natural selection. This entry was posted in Science of Evolution and tagged Bad arguments, creationism, evaluating evidence, evidence of evolution, evolution, evolution is blind. Bookmark the permalink. Thank you for yet another very clear and actually concise explanation. I myself often use an even simpler hypothetical: take a small lizard (say, 10 centimetres head to tail) hunting small burrowing creatures. If successive generations each grow on average 0.01% in body length, and their legs shrink by that same amount, what do you have after 50,000 generations? Limb-less-ness has actually evolved multiple times, often in association with burrowing behaviors, and there is a large body of studies on it. This review is one such example, but it is a bit old. Many thanks for the great explanation! I’m a firm believer that (in general) people have poor knowledge of how science works, and even poorer knowledge about evolution. Plus, within Christianity, the denominations that have no issues with evolution are doing a poor job of educating their flock about the issue. Typically, the Creationist denominations are doing a good job of misinforming their people with horsecrap factoids as you mentioned. Just a note to say glad I found your site. Being a 7th Grade Science teacher I always look for ways to make it easy and enjoyable way for the kids to understand the way Science works. It isn’t always can easy thing to do! You present things in such a clear, easy to learn manner. I have added and use your information now that I found it. I particularly like the evidence you give. Your style is somewhat like my own, present things in a clear logical cause and effect way. How can you go wrong with that? You have given me several good ideas. Thanks! Thanks, I’m glad my blog was useful for you. Good luck with your students! If I aske to post a link to this on a site devoted to opposing creationism (TSZ) would you have objections? As long as it is relevant to the topic at hand, no, I have no opposition. You challenged me on my comments on genetic drift, but the comments had closed before I could reply. First: I was too extreme in calling your post way overly simplistic. From a quantitative genetics perspective it is simplistic. Way over simplistic? probably not. De Brito, R. A., L. S. Pletscher and J. Cheverud (2005). “The evolution of genetic architecture. I. diversification of genetic backgrounds by genetic drift.” Evolution 59: 2333-2342. Goodnight, C. J. (2006). Genetics and evolution in structured populations. Evolutionary Genetics: Concepts and Case Studies. C. W. Fox and J. B. Wolf. Oxford, Oxford University Press: 80-100. There isn’t much data on the subject because nobody looks for it. Thank you for the papers, I am currently in the middle of field work and only have brief internet access, but I look forward to reading them and getting back to you when I return. Sorry for the slow response. As I said, I have been in the field and have only had intermittent internet access. I have now read the two papers (though I have not been able to obtain a copy of the book), and as I suspected, you and I seem to be talking about two different things. The papers looked at a handful of specific traits where gene interactions produced results other than what we would intuitively expect from a bottleneck. I certainly agree that diversity can increase within specific traits, but that was not what I was talking about in the post. Rather, I was describing the overall loss of diversity that occurs across the entire genome, and the ability of bottlenecks and genetic drift to result in the loss of alleles and overall reduction in diversity has been extremely well documented. You can read a good (but admittedly old) paper on the theory here (http://www.ncbi.nlm.nih.gov/pmc/articles/PMC1202664/pdf/675.pdf), and there are hundreds of studies that have observed a loss in diversity following a large reduction in population size. To put this another way, as a general rule, bottlenecks and genetic drift cause some alleles to become fixed, which results in an overall loss of diversity, but when specific traits interact, then the diversity for those specific traits can increase. So I was describing the overarching trend, rather than the subset of exceptions. That approach is admittedly simplistic, but the purpose of the post was simply to provide a general introduction to the topic that is easy for people with no background in genetics to understand, so I think that it really only makes sense to talk about the big picture. It is also worth mentioning that in the Bryant et al. 1986 paper, they bottlenecked the populations, but instantly allowed them to return to a large population size, which means that the effects of genetic drift would be minimal (i.e., many studies have shown that the loss of diversity is small if populations quickly return to large population sizes following a demographic bottleneck, however, if the populations remain small, then genetic drift causes many alleles to become fixed and diversity is lost). So I would be really interested to see what happens if their experiment was repeated but the populations were kept small rather than allowing exponential growth. I agree we are talking about different things, but I will have respectfully disagree that what I am talking about is limited to a handful of traits. What you are talking about is molecular genetic diversity and in this you are absolutely correct. Bottlenecks and drift are sampling problems, and the decline in the number of alleles per locus should follow the rules of binomial (or multinomial) sampling (with possible deviation due to linkage and what have you). What I am talking about is the additive genetic variance, which is the variance that can contribute to the response of a population to selection on phenotypes. What we know from molecular studies is that everything interacts with everything. There is no such thing as a gene product that doesn’t interact with something else. Because of this bottlenecks can do wild and unpredictable things to genetic variance components. When the correct studies are done (the deBrito study is an example) everything is embarrassingly significant. That said bottlenecks apparently often do the right thing: lead to a decline in genetic variation. My suspicion is that this is a case of a mean field model giving the right answer for the wrong reason. That is, drift and selection destroy epistatic genetic VARIANCE (but of course the interactions themselves don’t go away). A population that has been under long term selection in a finite population may show a decline in variance due to a bottleneck as long as the selective environment does not change. This is fine from a practical standpoint, I suppose, but not very satisfying as a scientist. Final point: Never forget that selection acts on phenotypes not genes, so it is the additive genetic variance, not the molecular genetic variation that is important in nature. here is a nice readable review that is not by me. Well clearly it has to be incorrect. For example, people say “Well, walking is possible” and creationists say “No, walking is not possible, you can take a single step sure, but what comes after that?” to which you describe that you step forward with the other foot and they go “Aha, now you’re stuck because what comes after that?” in which case it’s just you step out with your other foot and take one more step and repeat this until you’ve arrived at your destination.